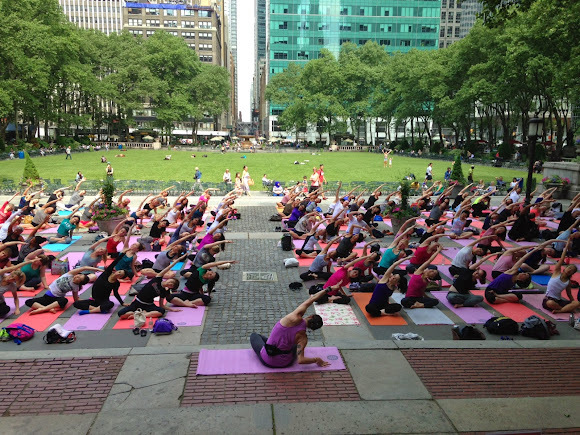 With all of Bryant Park's fitness offerings, this is the summer that you cancel your gym membership. We've thought of nine different ways that you can stay fit this summer with our free classes and healthy eating. No matter your exercise preference, you have no excuse! Its a no-brainer that Bryant Park Yoga is a fantastic way to stay fit this summer: With classes twice a week, you have plenty of opportunities to get a stamp on your Frequent Yogi Card--your body will thank you for your dedication, and you'll rack up great rewards at Athleta and YogaWorks in the process. Plus, mats are provided so you can just show up. What's not to love? This photo is from Tuesday's class on the Upper Terrace. Photo credit YogaWorks. Our Pilates class with Pilates on Fifth helps you get long, lean, sit taller, and add years to your life. You'll feel the burn as you strengthen your core, with enough time between the end of class and the beginning of the workday to cool down and get to the office. The redesigned ping pong tables have resulted in better play and an updated look. If you really want to up the ante and see why ping pong is an Olympic sport, register for our ping pong tournaments; the next is on June 4. The redesigned tables help you play like a pro. Our Tai Chi series with Tai Chi Chuan Center is entering its 11th year. You can strengthen your body and mind every Tuesday and Thursday morning from 7:30 to 8:30 on the Fountain Terrace. With Dancing in Bryant Park and Bryant Park Moves with Limón Dance, you'll be learning new steps and burning calories in the process. Staying fit has never been this fun...or hot! Our most intense workout is our Wednesday morning boot camp with The Rise NYC. You'll get in all your cardio and strength training needs before most people have even gotten out of bed. How's that for productive? At Boot Camp, you'll do dozens of ab exercised before most people have had their morning coffee. Did you know that a 180 pound person can burn up to 327 calories per hour while juggling? With over 10 hours per week of juggling at the park, you do the math. The most important thing during these long summer days is to remain hydrated, especially when working out. The Bryant Park Klean Kanteen, available for purchase through our online shop, not only keeps you hydrated, but also saves plastic water bottles from landfills. With 'wichcraft selling green juices by liqueteria and the arrival of artisan juice places in the Bryant Park neighborhood, you can replenish your depleted stores and bounce back from a tough workout.